The realization that uncertainty is the only guarantee in life doesn’t offer much comfort, especially if that uncertainty induces feelings of anxiety. Anxiety is an emotion most of us are all too familiar with: that sense of worry or unease about the unknown. With much of the global landscape colored by unforeseen political changes, the unexpected loss of influential cultural icons, and unanticipated business shake-ups, who can be blamed for feeling more on edge than usual? Unease or feelings or unsettledness around these changes is not surprising, but through research, Exponential noted an interesting pattern of people becoming anxious in predictable ways. Most notably, this kind of anxiety was defined by a feeling of lack of control and a perception of helplessness. While these findings can be applied to consumers, we also see that marketers also undergo similar experiences: we noted that marketers are 38% more likely than the average American to consult anxiety support sites! #1 Breath deep and lean into the facts. For marketers: Don’t underuse your best asset. By focusing on the facts, you can dissipate anxiety. “Marketers using data-driven strategies are six times more likely to report a higher profit.”* Adopt a data-driven audience targeting strategy. Put your data to work for you to understand consumer purchase intent and measure success. 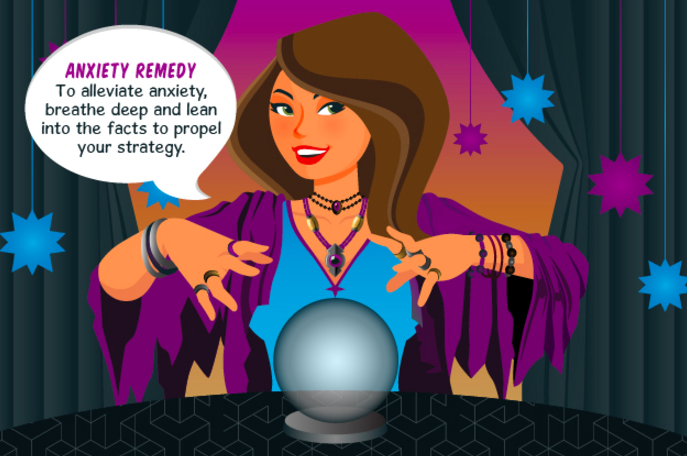 Marketers are 86% more likely to read their horoscopes to predict their future. A single generic prediction may not be the most accurate form of advice, so accept the unknowns and let your life happen. #2 Engage in the activities you are good at and eliminate efforts that are redundant. For marketers: Stop trying to do everything yourself. Adopt machine learning in your marketing strategy to manage campaign optimization and standard audience planning. With more time, you can focus on activities you are good at, such as interpreting data, working closely with clients and creative messaging. Marketers are almost 3x more likely to read online blogs on their interests. Put your research to good use by applying those findings towards improving your everyday life! #3 Stay flexible with your strategy, yet grounded with your objectives. For marketers: Tackle adaptive marketing to respond to your consumers’ interests and needs as they relate to a brand. Marketers are 25% less likely to be reading up on yoga. Reading more about mindfulness practices and meditation will help you navigate through these changes. #4 Don’t neglect what you need; take care of yourself and your clients. For marketers: According to a GroupM forecast published in AdAge, “Total advertising spend worldwide for 2017 is predicted to be $547 billion, up 4.4% from $524 billion in 2016.”** Avoid cutting ad spend, which weakens market share and prolongs eventual recovery. Continue to reinforce the need to position yourself amongst your competitors. Marketers are 41% less likely to read about personal health and fitness than the average American. Focus on a holistic approach by taking care of your body and your mind. #5 Spend time with people you like. For marketers: Marketers are overly cautious. To avoid the negative impact of risks, work with partners who understand your goals and who you trust to give you valuable, realistic advice. Marketers know how to network personally – they are 5x more likely to engage on social media, but need to learn how to extend it professionally. For the full anxiety remedy experience, click here. *Data Driven and Digitally Savvy: The Rise of the New Marketing Organization (The Growing Advantage Gap Between Data-Driven and Traditional Marketing Approaches). Rep. Forbes (in Association with Turn), Jan. 2015. Web. **Stein, Lindsay. “Digital Share of New Ad Dollars to Reach 77% Next Year, GroupM Forecasts.” Advertising Age. N.p., 5 Dec. 2016. Web.